Yvonne Litschel is a writer living in London. Previously she has read as part of the European Poetry Festival. Her debut pamphlet Moth Dust was published in January 2018 by Sampson Low. She has a forthcoming pamphlet entitled Immurement, set for release in March 2019 with Broken Sleep Books. Her website: https://yvonnelitschel.com. Her Twitter: @yvlitschel. 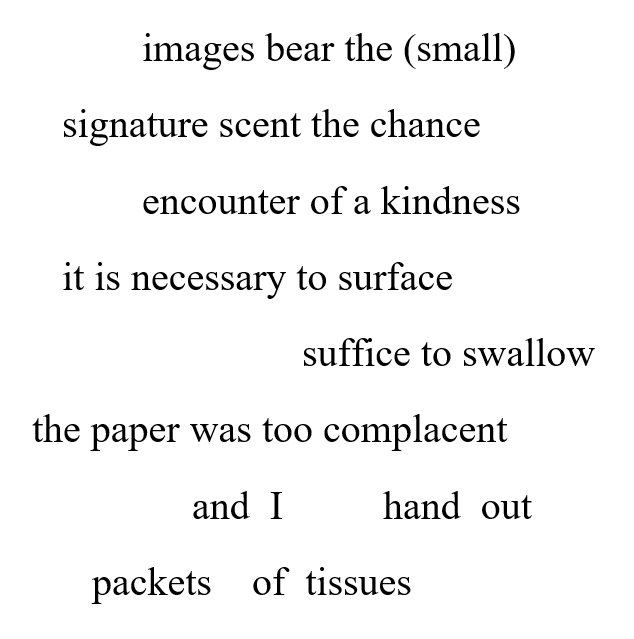 This entry was posted in Poetry and tagged Yvonne Litschel. Bookmark the permalink. I love how you played with the text! “Eunoia Review” could use more of these (and I’m glad they’re taking chances on doing so! )!